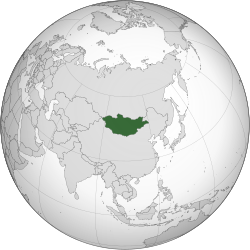 Orin-ìyìn orílẹ̀-èdè: "Монгол улсын төрийн дуулал"
↑ "Mongol" is often used almost synonymously, but is usually not understood to include minorities like Kazakhs or Tuvans. ↑ 5.0 5.1 5.2 5.3 "Mongolia". International Monetary Fund. Retrieved 2009-04-22.